I go through phases where I’m mildly obsessed with a different cookbook author. Rick Bayless and Mark Bittman have held a top place in my affections for the longest stretches at a time. This week, a new author sits comfortable in that seat: Melissa Clark. If you don’t know about Melissa, that needs to change right now. She writes a regular column for the New York Times, but, as a Bostonian, I’m not a daily reader and often forget to check it out on-line on Wednesdays. No worries. Melissa has published two wonderful cookbooks, complete with delightful headnotes or full-blown essays to accompany each recipe. I made a two winner dinners from her books this week. The first was one of my newest favorites. Melissa’s Mother’s Roasted Chicken on Mustard Croutons, from In the Kitchen with A Good Appetite. 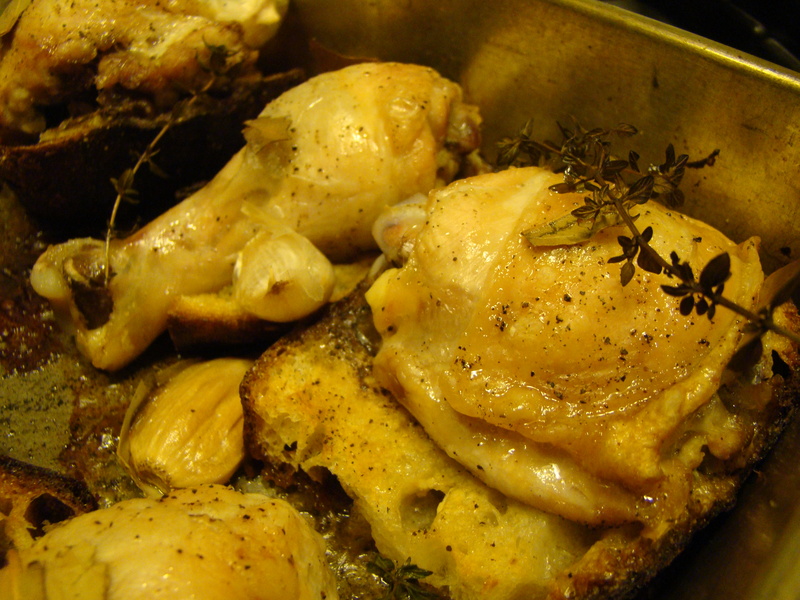 This recipe reminds me of Dorie Greenspan’s Roast Chicken for Les Parasseux (Lazy People), but it’s even quicker and easier. 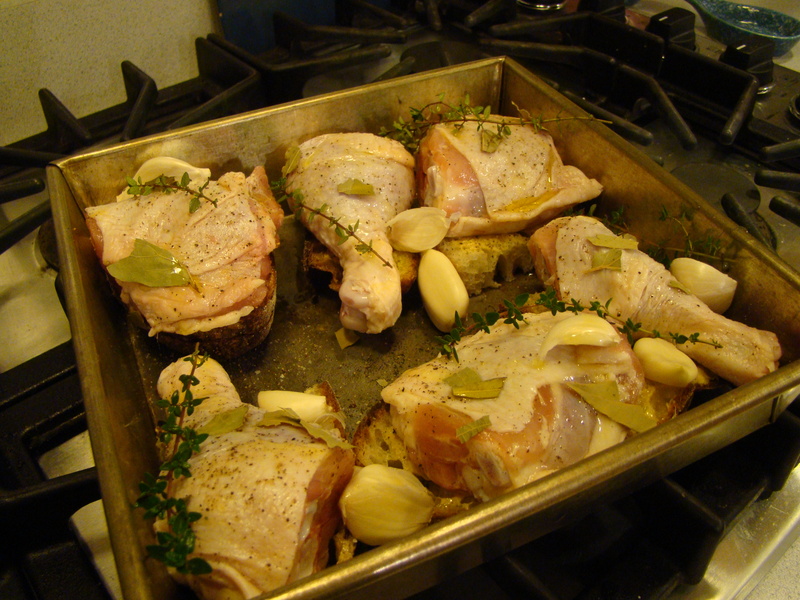 Chicken pieces, in my case, thighs and drumsticks, are roasted on top of slices of country bread coated with Dijon mustard. Everything is seasoned with salt and pepper, decorated with thyme springs, bay leaves, and garlic cloves and drizzled with extra virgin olive oil. It only takes 40 minutes in the oven. The best part is the bread cushion that each piece of chicken gets served on. It’s rich with chicken fat and juices mixed with a generous dose of mustard. We love, love, love it! On the side, I made Roasted Bagna Cauda Broccoli from Food 52 that was amazing! 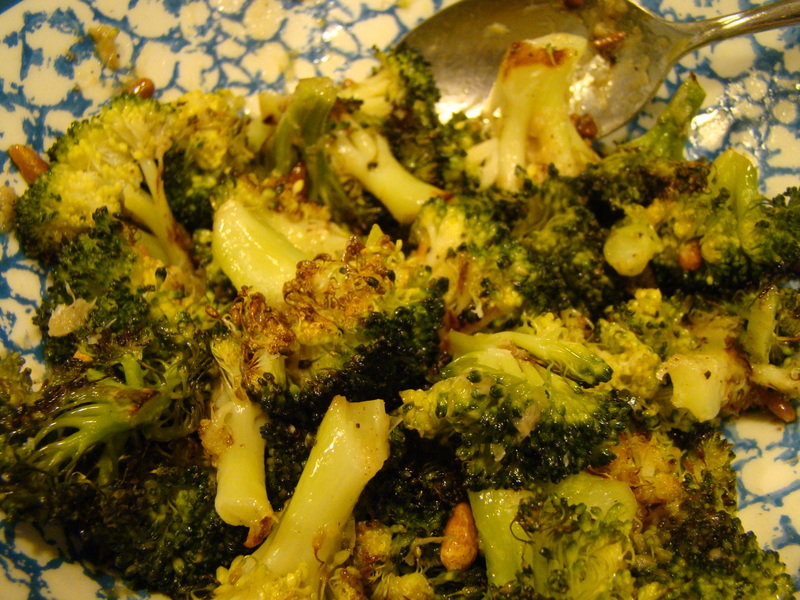 The blasted broccoli is tossed in a warm Caesar-like sauce. It called for a sprinkling of almonds on top, but I used toasted pinenuts instead. 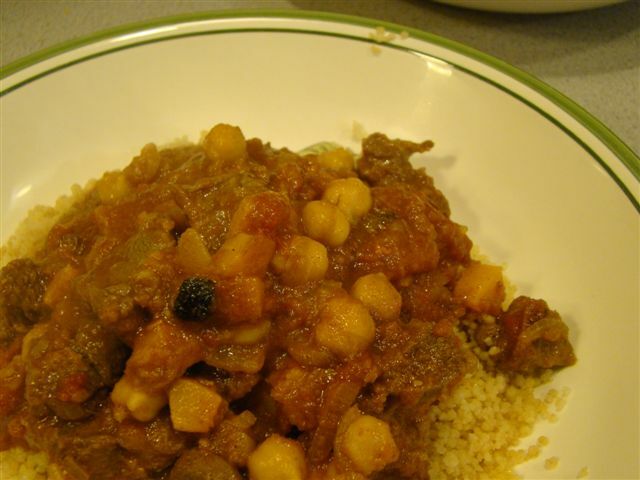 The other dinner was a slight variation of Braised Pork with Cinnamon, Tomatoes, and Olives from Melissa’s newest book, Cook This Now. This book is organized seasonally, month by month. I jumped a little bit ahead to the March chapter. The recipe called for pork shoulder, but I used boneless country-style ribs, which are from the shoulder end of the loin. 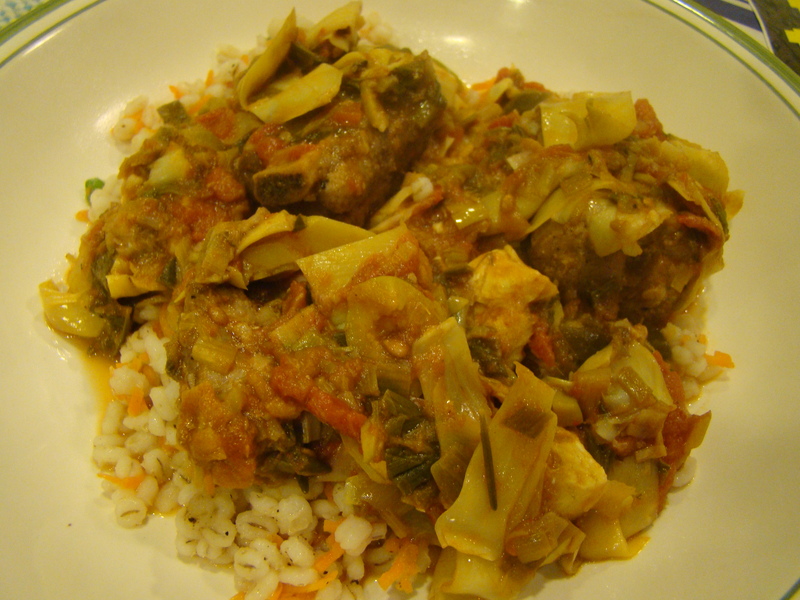 As I do with many stews, I used half the meat (one instead of two pounds) and added more vegetables. I would usually double the veggies but this recipe didn’t really have any other than tomatoes and leeks. I threw in an extra leek, and then added two cans of drained and quartered artichoke hearts for the last bit of cooking along with the olives. All the ingredients melded together like old friends. Melissa suggested serving the braise over polenta, but that’s not a favorite at our house. Instead, I served it over barley with carrots and scallions, another recipe from the April chapter of the same book. Melissa Clark remains my cookbook hero of the month, and the foreseeable future! Both of her books offer many more tempting recipes to try, so stay tuned for my next choice. If you have a favorite from either of these books, please suggest! Or, if you have your own cookbook hero, share! I’m always open to jumping on a different bandwagon.